If you're interested in pristine coastal reefs and a magical coastline without the Molokini crowds, book this one! Snorkel remote coves, pinnacles and bays experienced by few and inaccessible by car. Sightsee the crystalline volcanic formations of Mail's most recent lava flows. Trip includes snorkeling at dolphin and turtle habitats, lunch, beverages and snorkel gear. The Kanaio Coast Tour offers an opportunity to explore a rarely seen part of Maui, The Volcanic Kanaio Coast and a variety of remote exotic snorkeling sites, including both spinner dolphin and green sea turtle habitats. The Kanaio Sea Caves... Passengers can expect a rare treat as they tour along Maui's Gold Coast past Wailea and Makena to a remote and inaccessible coastline with spectacular views of the slopes of Mt. Haleakala. About 200 years ago at Kanaio, molten lava exploded from a side vent and poured into the ocean forming incredible lava arches, grottos and sea caves. Photographers will delight with the array of unique formations that await at every turn. Dolphins Dead Ahead!... 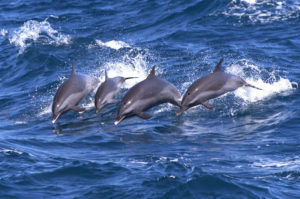 Following Kanaio, you will cruise to the protected waters of La Perouse Bay, frequently encountering a school of spinner dolphins, including babies, along the way or in the bay it's self. Named for their acrobatics, these playful mammals will frolic in the wave produced by our boat sometimes only a few feet from the bow! Turtlely Cool!... Departing La Perouse Bay, we make one more stop in Makena where we serve a delicious buffet lunch and snorkel with sea turtles and spotted eagle rays near pristine lava fingers. 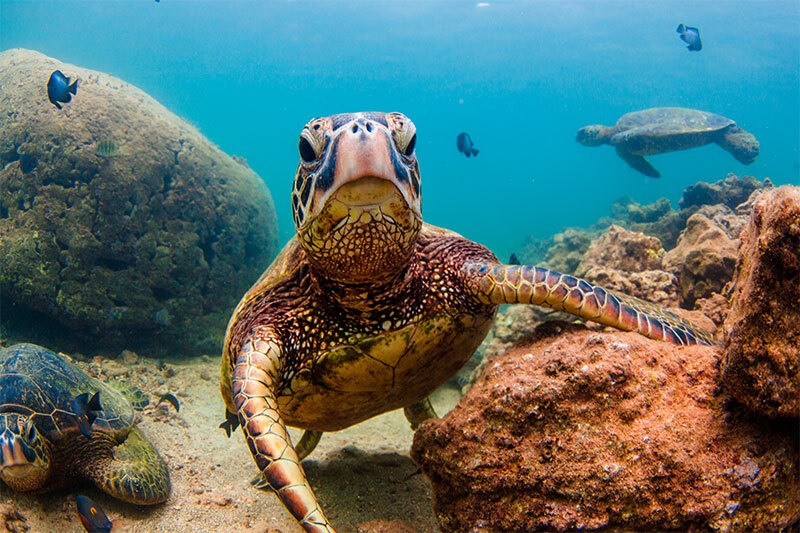 these turtles, although endangered and protected, are accustomed to seeing snorkelers and do not mind being photographed as they surface for air just a few feet away.